Copyright %C2%A9 2018 James Castle Collection and Archive LP%2C All rights reserved. 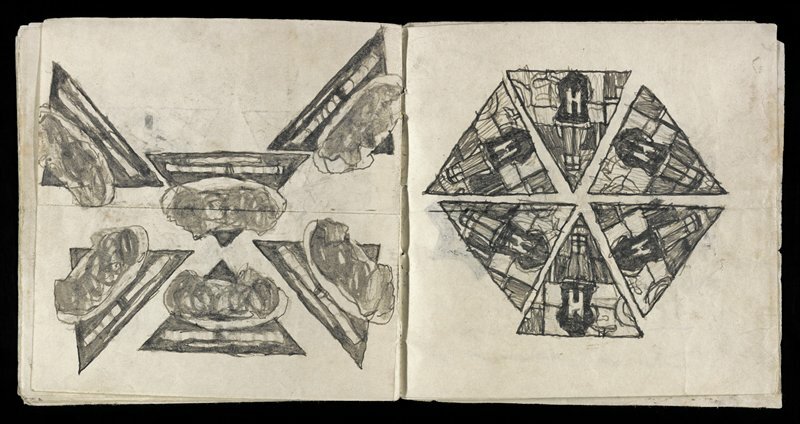 For this undated handmade book, Castle created a series of graphically complex “kaleidoscope” drawings, so named because they emulate the visual effects of a kaleidoscope, an optical instrument composed of a cylinder, multiple mirrors, and loose beads or bits of colored glass. As one gazes into a kaleidoscope and turns the rotating cylinder, light entering from the other end is reflected among the mirrors and loose materials, creating an infinite array of symmetrical patterns. Castle was fascinated by the abstract geometric configurations of the kaleidoscope (he owned several) and adapted its effects for his own invented compositions, some of which also included advertisements for commercial products. Copyright © 2018 James Castle Collection and Archive LP, All rights reserved.